THE WATER DIVINER is a brave directorial debut from Russell Crowe. It tells the tale of a grieving father who journeys from Australia to Turkey to find the graves of his three sons, killed in the battle of Gallipoli four years previously. In doing so he encounters a still highly contested and wartorn land, whether the men of the Imperial War Graves Commission has to rely on its former enemies, the Turks, to help them locate bodies on the field of battle. And while World War One may be over, the war for the future of Turkey is only just beginning, with a nationalist uprising under Kemal Ataturk beginning, bringing with it a fierce debate over secular modernisation versus traditional religious values. This conflict is expressed in the two relationships the father forms in Turkey. The first is with the Ottoman General who commanded the army opposing his sons - a quiet and considered man who is full of humanity as well as nationalist pride, played brilliantly by Yilmaz Erdogan. The second is with a war widow called Ayshe played by Olga Kurylenko. By balancing Russell Crowe's father with two Turkish characters, the writers of the film insure it against any charge of jingoism and ensure that the overall point, that war causes havoc and tragedy on both sides, is made rather than told. There's so much in it that could have been ridiculous in this film. The idea of a man who can intuit where his sons died in battle. A grieving widow who in the midst of tragedy finds a connection with a younger woman. But it's all due credit to Russell Crowe that this isn't the case. We understand from him that his ability to divine water is based on a deep understanding of topography and that this can be applied meaningfully, with his sons diaries, to the battlefield. And while some critics have resented the candle-lit dinner with Ayshe, I think it is profoundly necessary. Because the message of this movie is a hopeful one. While it rightly never shies away from the horror of war, by showing moments of connection between the Aussie war graves soldier and the general, between the father and the general, it shows that war doesn't have to define us. That there is hope. As I watched this film, elegantly shot by Andrew Lesnie, and delicately told, I wondered if Russell Crowe was going to turn into one of those actors, like Clint Eastwood, who becomes better known as a director. I think he has superb directorial instinct and I can't wait to see what he does next. 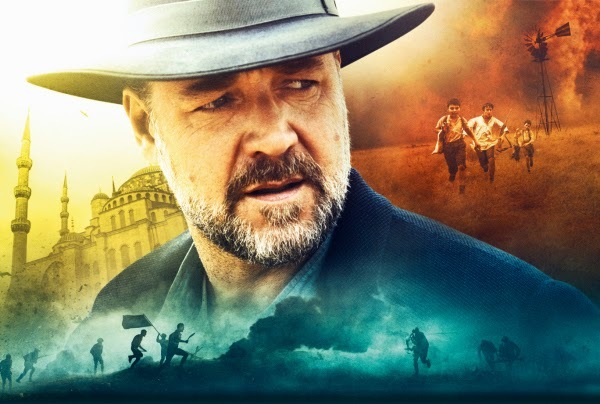 THE WATER DIVINER has a running time of 111 minutes and is rated R. The film was released last year in the UAE, Kuwait, Australia, New Zealand and Turkey. It was released earlier this year in Italy, Thailand, Romania, Croatia, Malaysia, Slovenia, Latvia, Estonia, Portugal, Brazil, Lithuania, Poland, Finland and Russia. It is currently on release in the UK and Ireland. It will be released on April 15th in Belgium, France, Switzerland and the Netherlands; on April 23rd in Argentina, Israel, China, Spain, India and the USA; on May 1st in Taiwan; on May 7th in Austria, Germany, Denmark, Singapore, Norway and Sweden and on June 4th in Chile.